Courage, I learned, is the state or quality of mind or spirit that enables one to face danger, fear or vicissitudes with self-possession, confidence, and resolution – aka bravery. I think we sometimes have the wrong impression of courage. We often think of a hero type person who is Captain America or Thor-like (I live with four males, this is what I am exposed to!) who take on whole armies of enemies or even go right into the enemy’s camp to take them on. 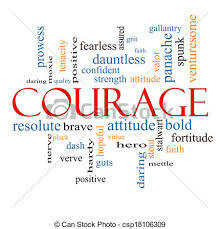 True courage often gets overlooked because it can be a lot less “out there” and more quiet and internal. It is in our most vulnerable moment that we, in the face of fear and overwhelm, make the decision to take hold of courage. I think courage starts way back before the actual action that defines that moment. If courage is a state or quality of mind or spirit, then perhaps we need to be paying attention here. People who have done great feats of bravery often say when interviewed, “I just did what anyone else would have done”. Taking courage is an inside job; it starts with what we focus on and what meaning we create out of that focus. When the moment requires it, the brave action is just the result of that. If you want to live a life marked with courage, take hold of your focus. What are the thoughts you have daily? Take captive the ones which are unhelpful and expose them to the Light. Check what meaning you are creating out of that focus. Does this align with what God is speaking over you, or does it align with what the enemy of your soul would like you to believe – so that he can cause you firstly to distrust your Father and secondly, not to step up to your calling and purpose? So what does Taking Courage look like for normal non-Thor people…..? It is writing that book, it is stepping into a job that feels much bigger than you, it is starting that business that is keeping you up at night, it is saying yes to that opportunity, it is closing that business down that has come to the end of its season, it is hiring that extra person you need, it is choosing to believe the truth and not the lie, it is saying no to that opportunity. Take courage today! Start by looking at what you constantly focus on when life throws vicissitudes (I know… makes me smile too ) at you and see if it aligns with what God is saying, then check the meaning you are creating out of that focus. Then, when the moment arises, you will Take Courage and arise and shine. Now go forth and be awesome!! Great words Coralie. Life can be exciting, dull, or downright bruising. The temptation for me is to avoid daily the challenges which may end in conflict or hurt because they are difficult, and simply “retire” to a life of ease. I need a daily discipline first thing – Bible reading and especially prayer. I diary the results. And I walk it with others.